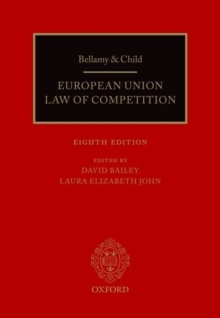 Now in its eighth edition, Bellamy & Child is the leading authority on EU competition law. It offers a clear and comprehensive exposition of law and procedure, with exhaustive citation of judicial and legislative authorities. Fully up-to-date with major developments in substantive law and case law, this is an essential purchase for EU competition law practitioners.